Monkey Business - That's The Bunk! Home | Movies | Monkey Business | Scene: That's The Bunk! The Setup: The Marxes have just stowed away on an ocean liner. They've been hiding in individual kippered herring barrels in the hold, and have just escaped capture by the crew. Groucho runs into the Captain of the ship. 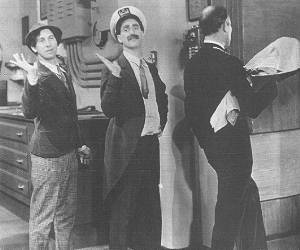 To draw attention away from the fact that he's a stowaway, Groucho engages the Captain in a little idle banter. We then proceed to the Captain's quarters, where Groucho encounters Chico. First Woman: Oh Captain! Tell us about the stowaways. Captain: Oh, I'll have them in the brig before long. Second Woman: That's terribly romantic; I'd love to meet a stowaway. Groucho appears on deck, right on cue. Captain: (to Groucho) Hey you! Groucho: Are these your gloves? I found them in your trunk. (to women) You girls go to your rooms; I'll be down shortly. Groucho: Are you the floorwalker of this ship? Groucho: I wanna register a complaint. Captain: Why, what's the matter? Groucho: Matter enough. D'you know who sneaked into my stateroom at three o'clock this morning? Groucho: Nobody. And that's my complaint. (pause) I'm young. I want gaiety, laughter, ha-cha-cha. I wanna dance! (sings) I wanna dance 'til the cows come home! Captain: Just what do you mean by this?! Groucho: (ignoring the Captain) Another thing...I don't care for the way you're running this boat. Why don't you get in the back seat for a while and let your wife drive? Captain: I want you to know that I've been Captain of this ship for twenty-two years. Groucho: Twenty-two years, eh? If you were a man, you'd go in business for yourself. I know a fellow started only last year with just a canoe...now he's got more women than you can shake a stick at...if that's your idea of a good time. Captain: One more word out of you, and I'll throw you in irons! Groucho: You can't do it with irons; it's a mashie shot. It's a mashie shot if the wind is against you, and if the wind isn't I am. And how about those barrels down below? Groucho: Yeah, I wouldn't put a pig in one of those barrels. Groucho: (interrupts) No, not even if you go down on your knees. And here's your gloves. (Groucho offers the gloves to the Captain. The Captain reaches for them, then...) Oh, you would take 'em, wouldn't ya? Groucho: (entering Captain's quarters) And keep away from my office. Captain: Now see here you! Groucho rushes into the Captain's quarters and slams the door behind him. He finds the Captain's cap hanging from a hook and puts it on. Chico enters. Groucho: How dare you invade the sanctity of the Captain's quarters?! Chico: (realizing who he's dealing with) Heh, heh. I thought you was the Captain. Hey, I'ma hungry. I'm gonna look for something to eat. Groucho: I'll take care of that. (speaks into intercom) Hello? Send up the Captain's lunch. Groucho: Send up his dinner too. (listens) Who am I? (looks at cap) I'm the Captain; you wanna choose up sides? (hangs up intercom and picks up pipe to engineering) Oh engineer. Will you tell 'em to stop the boat from rocking, I'm gonna have lunch? (to Chico) Well, what's the matter with you? Chico: What'sa matta with me? I'm hungry. I didn't eat in three days. Groucho: Three days? We've only been on the boat two days. Chico: Well, I didn't eat yesterday, I didn't eat today, and I'm not gonna eat tomorrow...that makesa three days. Groucho: Well state your business. I've gotta shiver my timbers. Groucho sings and dances a hornpipe. Chico: I got no business. I come up to see the Captain's bridge. Groucho: The Captain's bridge? I'm sorry...he always keeps it in a glass of water while he's eating. Would you ah...like to see where he sleeps? Chico: Huh...I saw that...that's the bunk. Groucho: You're just wasting your breath, and that's no great loss either. A fine sailor you are. Chico: Huh...you bet I'm a fine sailor. You know my whole family wasa sailors? My father wasa partners with Columbus! Well, whadaya thinka that, heh? Groucho: Your father and Columbus were partners? Groucho: Columbus has been dead four hundred years. Chico: Well, they told me it was my father. Groucho: Well, just hop up there, little Johnny, and I'll show you a few things that you don't know about history. (draws circle on globe) Now look. Now there's Columbus. Groucho: Would you mind getting up off that fly paper and giving the flies a chance? Chico: Aw, you're crazy. Flies can't read papers. Groucho: (ignoring him) Now, Columbus sailed from Spain to India looking for a shortcut. Chico: Oh, you mean strawberry shortcut. Groucho: (aside) I don't know...when I woke up, there was the nurse taking care of me. Chico: What's the matter? Couldn't the nurse take care of herself? Groucho: You bet she could...but I found it out too late. (pause) Well, enough of this. Let's get back to Columbus. Chico: I'd rather get back to the nurse. Groucho: So would I. But Columbus was sailing along on his vessel. Groucho: Not on his what, on his vessel. Don't you know what "vessel" is? Groucho: Do you suppose I could buy back my introduction to you? Now one night, Columbus' sailors started a mutiny. Chico: No...no mutinies at night. They're in the afternoon. You know, "Mutinies Wednesdays and Saturdays." Groucho: There's my argument, restrict immigration.